Yugi’s legendary Dark Magician gets a big boost in August’s The Dark Illusion booster set for the Yu-Gi-Oh! TRADING CARD GAME. With the first half of 2016 celebrating the Blue-Eyes cards of Yugi’s rival, Kaiba, the second half of the year follows suit by powering up Yugi’s monsters like Dark Magician! Yugi’s strategy relies on his famous Spells and Traps, befitting the cunning and guile of a master magician. 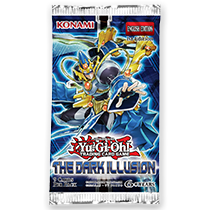 The Dark Illusion gives Spellcasters access to powerful cards like Magician Navigation, which Summons a Dark Magician from the hand and another DARK Spellcaster of your choice right from the Deck, then goes on to negate an enemy’s Spell or Trap! There’s also the Dark Magical Circle, the famous “ring” seen on many of Yugi’s cards, now finally made into a Spell Card in its own right.